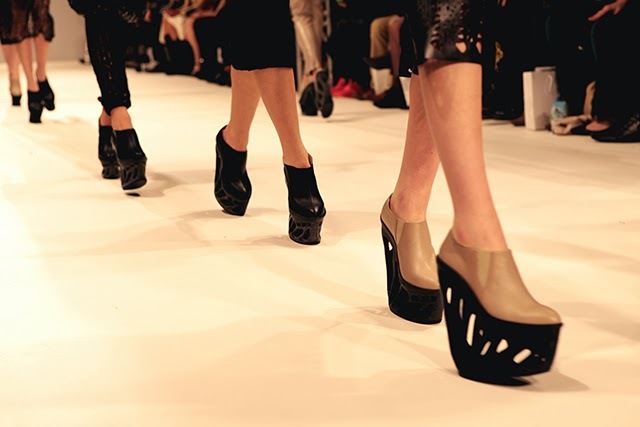 The Mercedes–Benz Kiev Fashion Days show just hit the catwalk at Fashion Scout with designers Anna K, Krasilnikova, Lara Quint, Lera Leshchova, Paskal and Yasya Minochkina showcasing their designs. 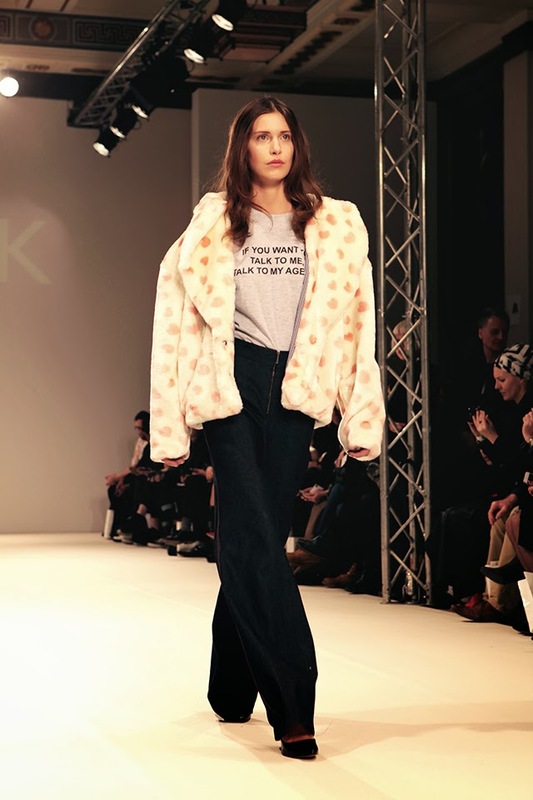 Designer and model Anna K was first up, raising a few eyebrows with wide-legged denim jumpsuits, and swing coats with polka dot faux-fur and gingham lining. 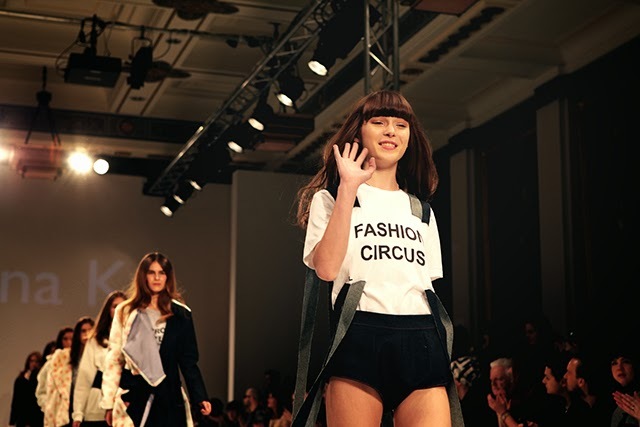 Anna showed her fun side with quirky captioned tees reading “Fashion Circus” and “Do you want to talk to my agent?” and denim hot pants which she rocked herself for the final look. Next up was Lara Quint. 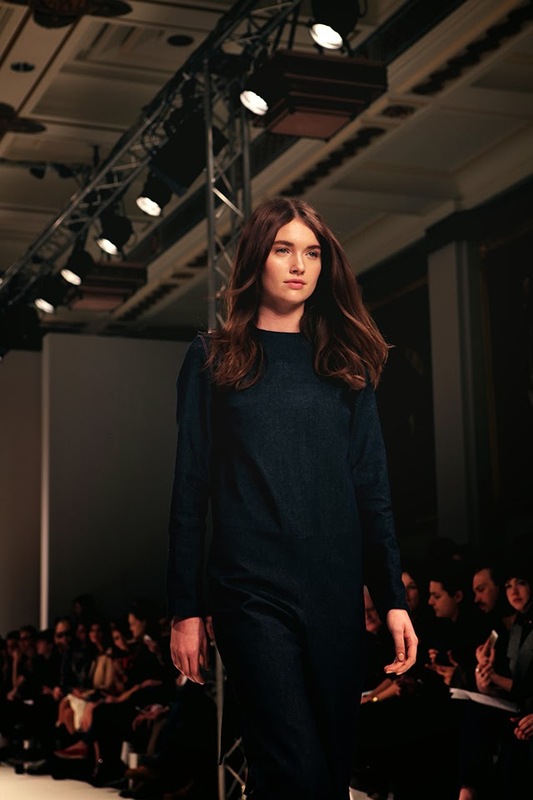 Known for her contrasting use of clean lines and volume, Quint’s AW14collection did not disappoint. A muted palette of monochrome and camel was shaken up by an injection of blood red towards the end. Ladylike tailoring in the form of boucle coats and corseted gowns were given an edge with addition of sheer organza tops and voluminous sleeves. 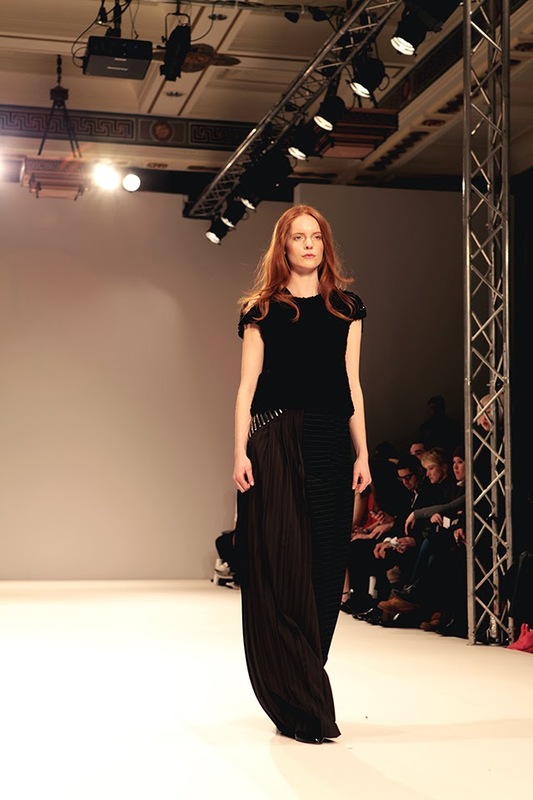 Cropped trousers with a structured basque created an interesting silhouette. One of the more anticipated of the designers, Julie Paskal ran with her trademark minimalism in a series of cage-inspired outfits. Sharp, well-cut mini-dresses in black and fuchsia were lifted by the addition of precisely executed cage like draping. A pink cropped jumpsuit made the biggest statement with its caged cape and trim. Paskal designs for the modern woman looking for something unique yet feminine, which is exactly what she achieved with this collection. Lara Leshchova was next to exhibit her latest collection. With a focus on highlighting the feminine silhouette, her grey, wool, cut-out shift dresses certainly achieved this while oversized chunky knits in purple an grey added some interesting body to the simple lines. The collection was interrupted by dashes of silver weaving and statement jewellery. The inclusion of boxy mini-bags were also bang on trend for the coming season. Irina Krasilnikova, known for her romantic elegance shocked the crowds with sheer knits, faux fur and laser cut leathers in her futuristic ensembles. Muted tones of grey, beige and charcoal featured heavily with dashes of burgundy adding a richness to the colour scheme. Fine-knit leggings were teamed with cropped, bristling jumpers however, the faux-fur and laser cut leather dress was the crowd pleaser of the show. The sports inspired collection of Yasya Minochkina drew the presentation to a close. Vibrant greens and interesting textures brought the sports look to life. Patent croc-effect skirts and tops teamed with knee-high socks brought a retro feel to the aesthetic. Minochkina has a unique ability to bring femininity to outwardly masculine design. The addition of an A-line monochrome mesh coat and black turtle neck dress with skater skirt lent a certain elegance to the minimalist compilation.